Crockett Hector “C.H.” Pasley (1876 - 1952) received his bachelor of law degree from the University of Iowa and founded this law firm in 1906. 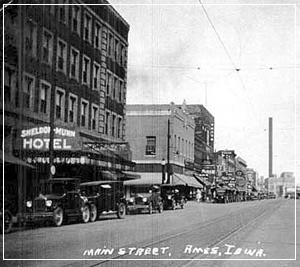 The City of Ames had been incorporated a mere 36 years earlier in 1870. Mr. Pasley provided for the wide ranging legal needs of area residents from an office on Main Street. Robert G. “Bob” Pasley (1915 - 2007) earned his juris doctor degree from the University of Iowa College of Law and joined his father in the practice of law in 1939. Bob suspended his practice for military service in World War II. Bob served as Ames city attorney and also served on the Ames City Council. Bob practiced law until 1980. Another veteran, William A. “Bill” Singer (1917 - 2011) joined the firm in 1948. Mr. Singer also suspended his practice to serve his country in the Korean conflict. Mr. Singer practiced again with the firm until his retirement in 1997. Milton D. “Milt” Seiser received his juris doctor degree from the University of Iowa College of Law in 1954 and practiced with the firm for many years. Mr. Seiser was regarded as one of the most hard working highly respected attorneys of his time. Mr. Seiser left the firm to serve many years with distinction as a judge of the Iowa District Court. Clarke A. Pasley joined the firm in 1965 and became the third generation of the Pasley family to practice law in the firm. Mr. Pasley received his undergraduate degree from Iowa State and his law degree from the University of Iowa in 1965. He practiced with the firm in a wide variety of areas until his retirement in June 2011. Stevan A. Holm received his juris doctor, with distinction, from the University of Iowa College of Law in 1966. Mr. Holm had a wide-ranging transactional practice until his retirement in 2005. This law firm broke the gender barrier for Ames and Story County. Jane Mathison joined the firm at a time when other firms could not even imagine a lawyer who was a woman, let alone hire one. We are recognized throughout Story County and all of central Iowa for our courtroom excellence and the other legal services that we provide. Our clients can expect that their phone calls will be returned as soon as possible and that they will be informed about the status of their case or legal matter every step of the way. We do our best to provide our clients with up-to-date information on their case and to speak to our clients in plain language. Our lawyers and our highly skilled staff share a common goal: delivering excellent legal services to our clients in a manner that is personal, prompt, efficient, and result oriented. We are proud of our reputation for the skill and knowledge that we bring to the practice of law and dispute resolution. We look forward to demonstrating our expertise, integrity, and caring should you ever need legal advice.